Could Duke Energy be lining up Itron as supplier for millions of smart meters yet to be deployed? During a conference call last week to discuss Itron’s second-quarter 2012 results, CEO LeRoy Nosbaum let slip a mention of a small but intriguing contract for the smart meter giant -- a $43 million project with Duke Energy. What could Itron be doing for Duke Energy in Ohio and the Carolinas that’s worth $43 million? Sharelynn Moore, Itron’s vice president of corporate communications, declined to comment on the subject in a Friday call, and Duke spokeswoman Paige Layne said only that the utility will be using Itron’s meters to replace manual-read meters at some homes and businesses in the Carolinas and Ohio. Not much to go on there. Any contract with Duke could be a big deal, however. The country’s third-largest utility became the country’s biggest last month with its $32 billion merger with Progress Energy (although the relationship has deteriorated fast). The combined utility has 7 million customers in North and South Carolina, Kentucky, Ohio, Indiana and Florida. That makes a big target for smart meter makers. In Duke’s case, the potential rewards are heightened by the fact that, so far, the Charlotte, N.C.-based behemoth hasn’t smart-metered most of its customers. For now, Duke’s Ohio territory is its only full-bore smart meter rollout, with about 700,000 meters deployed at present. That deployment in Duke’s coverage area around Cincinnati includes smart electric meters from Echelon, smart gas meters from Badger Meter and communications nodes from Ambient. GTM Research analyst Zach Pollock noted that Duke’s original RFP for its Ohio project didn’t specify a vendor for commercial and industrial meters, which could be part of Itron’s contract with Duke in the state. On the other hand, Duke is also interested in supplementing the work it’s doing with Echelon and Badger, he noted. How Duke adjusts its Ohio project may offer insight into how it intends to proceed in other states where it hasn’t deployed smart meters yet. The Ohio project is noteworthy in that it represents the only North American project for both Echelon’s smart meters and Ambient’s node products. It’s also the first time that Badger Meter used its one-way radio mesh Orion technology for gas meters, instead of the water meters for which it was originally designed. Duke has some time to figure out how it wants to proceed with smart meter deployments in other states. In the case of Indiana, the utility wanted to deploy another 800,000 meters in neighboring Indiana, and in late 2009 it won a $200 million Department of Energy stimulus grant that was meant to aid smart meter rollouts in both states. But a 2010 ethics probe that led Duke to fire its Indiana president has soured state regulators there to the utility’s requests for rate increases to fund other project. In October, Indiana utility regulators rejected Duke’s request to spend $22 million on initial smart meter deployment work, as well as a rate increase to cover storm repairs. In the Carolinas, Duke is holding off on AMI for a different reason. About ten years ago, it moved to an automated meter reading (AMR) system from Itron, featuring a “drive-by” system with meters that can broadcast their readings and other data to utility workers driving by in a truck, Layne said. Those meters can’t conduct two-way communication with the utility, which limits their functionality as smart grid devices. But Duke couldn’t justify the expense of replacing millions of meters that are only halfway through their expected 20-year expected lifespan, so right now it’s just replacing old manual-read meters in the Carolinas, Layne said. Right now, Duke’s smart grid work in the Carolinas include a virtual power plant project in Charlotte, as well as a synchrophasor deployment backed by $4 million in DOE stimulus funds. Duke is also “evaluating technology” that could enable its Itron AMR meters to work more like smart meters, Layne said in a Friday email. But “this is not something that will happen in the short term,” she noted. Itron has about 64 million of its AMR meters in the U.S. market, and has been working with multiple partners on ways to capture their data collection and one-way broadcasting functionality in a way that could serve utility smart grid needs. Duke has said it’s going to rely on cellular for large chunks of its smart grid network, and Itron bought leading U.S. cellular smart meter vendor SmartSynch this year, giving it another potential route into Duke’s good graces. Cellular is a good way to reach meters that neighborhood radio mesh networks can’t reach, and has been used for commercial and industrial meters for decades now. Cisco is one more big smart grid partner to watch. Cisco and Itron have integrated their technologies as an end-to-end smart meter and grid management network, all running on IPv6 compliant networks. The two are deploying about 2 million meters with big Canadian utility BC Hydro and just landed smaller neighbor FortisBC as a client. As for Duke, it became Cisco’s showcase U.S. utility client in 2009, and has since deployed the networking giant’s grid routers and switches on parts of its grid. But the two have remained silent on what else they’re working on, or whether they’re moving beyond distribution grid networks to things like smart meters. What about Progress’ smart meter plans? 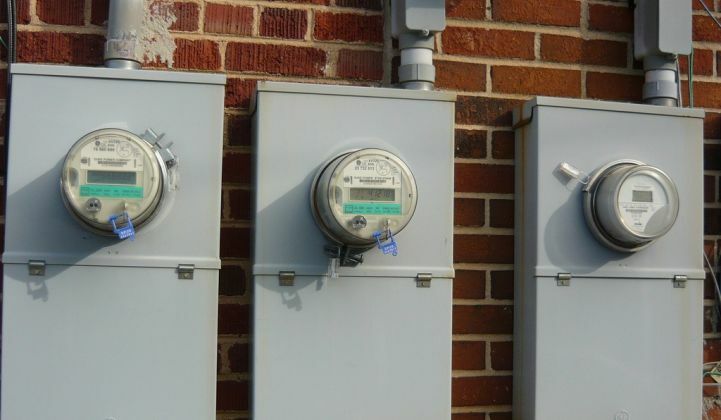 The Raleigh, N.C.-based utility won a $200 million DOE grant for smart grid projects including smart meters in 2009, and in February announced Silver Spring Networks as a partner to network meters and load-control devices in Florida and North and South Carolina. GTM Research’s GTM Scott AMI Market Tracker places Itron as the leader in networked AMI and AMR technology, with 95.8 million units in the field as of the first quarter of 2012. Most of these are the last-generation AMR meters, but Itron also holds first place in terms of AMI networking deployments, with Silver Spring Networks in second place and Sensus in third, the report finds. Although the North American market for electric smart meters is slowing, there’s still plenty of room for growth, particularly with big utilities like Duke that haven’t committed to particular vendors yet. Current deployments could also produce data that will make it easier for utilities to craft their business cases for smart grid down the road. No doubt Itron’s competitors will be closely watching its Duke projects to see how it may lay the groundwork for a broader deployment to come.